This fried egg topped grilled ribeye is your breakfast or dinner of your dreams. 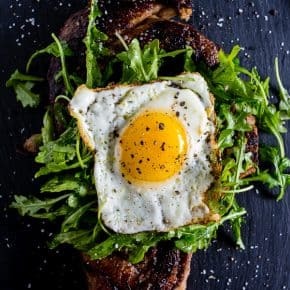 Deliciously seasoned steak grilled and then topped with a lightly dressed arugula salad and a super crispy around the edges fried egg. This is the type of dish you’ll devour and dream about! 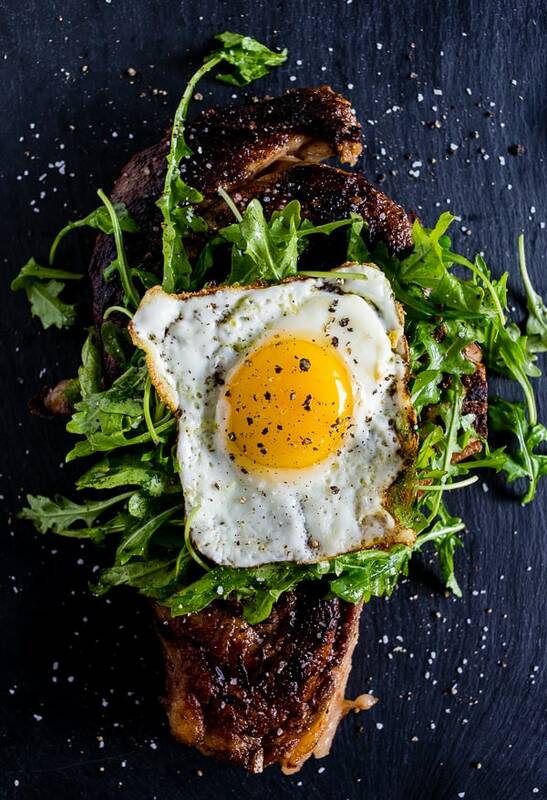 Ok, but really how good does this fried egg topped grilled ribeye look? I have been going through MAD red meat cravings lately and then I remembered I NEVER shared this recipe with you. I know it’s a super simple “recipe” but seriously it’s so damn good. 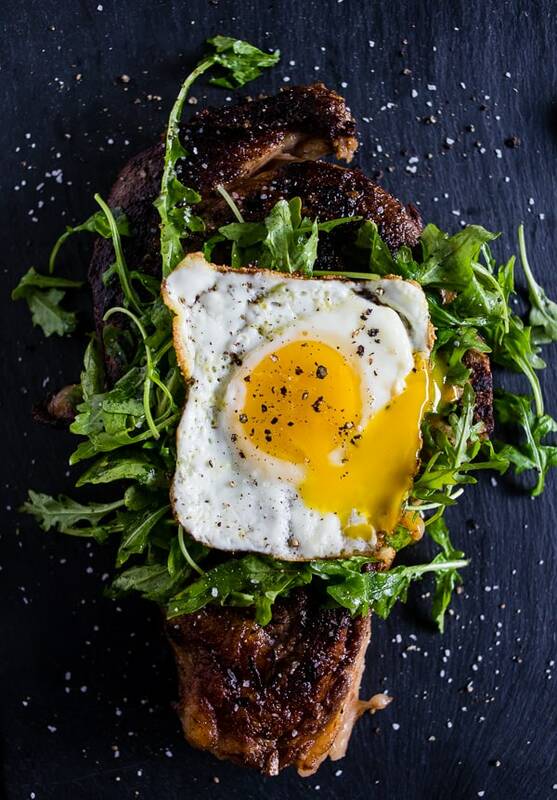 How can you ever go wrong with perfectly cooked ribeye topped with arugula and a fried egg? 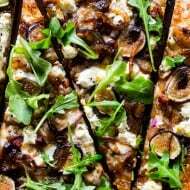 Also, that arugula totally counts as a salad to basically you’re eating diet food when you consume this recipe #science Alright maybe don’t claim this is a salad but you can claim it delicious. There are a million different seasonings people love to use on their steak and in this case, you really can use whatever you love. This time around I seasoned it with kosher salt, black pepper, garlic powder, onion powder and just a touch of chili powder. It’s a nice simple blend that consists of all spices I have on hand 24/7. When I’m feeling extra feisty I might even throw in some smoked paprika and crushed red pepper. Oh, and don’t skip the step where you season and rest. It really does help the meat pick up big time flavor all while locking in lots of juice of other meaty goodness. Plus you don’t really want to be grilling an ice cold steak. New to grilling? Check out my tutorial on how to grill the perfect steak! Since I’m a lover of all things eggs I went with a super crispy around the edges fried egg to finish off this fried egg topped grilled ribeye recipe. 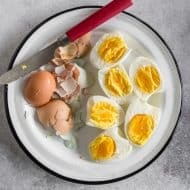 However, I’m sure over easy, poached or even picture-perfect sunnyside up eggs would go great with this dish. And since I’m using such a large cut of meat I consider this a full-on dinner meal but if you’re really into starting your day off with a full stomach this could totally work for breakfast. 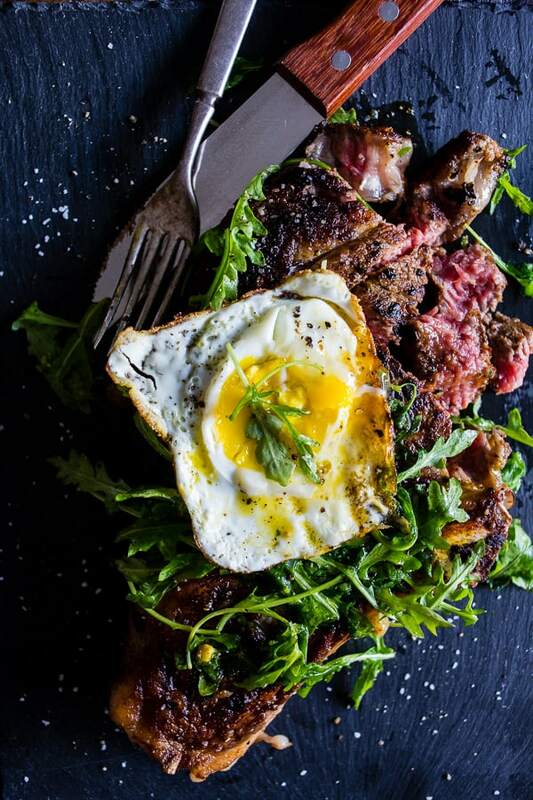 This fried egg topped grilled ribeye is your breakfast or dinner of your dreams. Deliciously seasoned steak grilled and then topped with a lightly dressed arugula salad and a super crispy around the edges fried egg. This is the type of dish you'll devour and dream about! Set out steaks and in a small bowl combine kosher salt, black pepper, garlic powder, onion powder and chili powder. Mix to combine. Season steaks on both sides and let sit out of the fridge for about an hour or until the steaks are just cool to the touch but no longer refrigerator cold. Shortly before you're ready to grill pre-heat your grill to medium-high heat. Depending on the thickness of your steak you may have to adjust your grilling time but for a steak around an inch thick I grill for about 4-5 minutes per side for medium-rare. Once the steak is cooked to your desired doneness remove from the oven and let rest for 10 minutes before serving. Remember, your steak will continue to cook a bit more while it's resting so take that into consideration when grilling. 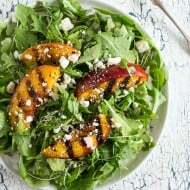 In a medium-sized bowl add baby arugula and a small squeeze of lemon and a small drizzle of olive oil. Toss to combine and season with kosher salt and pepper. You want the leaves to be lightly coated and not soggy. The amount of lemon you use depends on your personal taste preference. In a 12-inch skillet add olive oil and set over medium-high heat. When the oil is hot add both cracked eggs into the skillet, season with kosher salt and pepper and cook until the white is fully set. I like to cook my eggs on higher heat because I love the crispy edges. However, you can cook your eggs whatever you prefer - over easy, sunnyside up or even poached. Awesome recipe and post! You are having some red meat cravings, seeing a lot of beef! Must need Iron! Love it! Will be using soon to kick off grilling season! WOW!! This looks incredible!! My family would LOVE this! That egg on top looks like the best idea ever! great idea, love the extra ingredients, the egg and arugula, great thinking, thank you! Everything is better with a fried egg on top!